The small Jewish community of Solotvin had a diverse religious life. There were Jews from all religious branches, such as Ultra-Orthodox, Hassidic, and secular Jews in Solotvin. According to a local legend, the Besht (Rabbi Israel Baal Shem Tov, founder of the Hassidic movement) spent a Sabbath in Rabbi Moshe Heilprin's house (Pinkas Kehilot, 350, see document). The first rabbi in Solotvin was Rabbi Moshe Heilprin (d. 1752), who settled in Solotvin in the 1740's. Other main figures of the time were the Moreh Tzedek in Solotvin, and Rabbi Tzvi Hirsh son of Yosef from Kalush (his tombstone), who served in this position until his death in 1833. Until his death in 1848 the Rabbi of Solotvin was R. Pinhas son of Yeshayah (his tombstone). In the 1850s, Rabbi David Berl son of Yaakov Brenner served as a dayan in Solotvin. In 1873 the rabbi of Solotwin was Rabbi Haim Ratzer (Wunder, 4:1024). Until 1875 a moreh tsedek was Rabbi Israel son of Barukh (his tombstone). In the late nineteenth century the rabbi for several years was Rabbi Elimelekh son of Efraim Mordechai Porila (d. after 1948) (Wunder, 4:18). Rabbi Tzvi Arie son of Israel Yaakov served as the rabbi and the head of the rabbinical court for 32 years, from 1852 until his death in 1884. He was a hasid as was his father (his tombstone). Rabbi Nahum Uri son of Rabbi David Yitzhak Gellis (b. 1852) was the rabbi of Solotvin from 1884 until his death (Ohalei Shem, 522; Pinkas Kehilot, 350; Edward Gelles, "An Ancient Lineage: European Roots of a Jewish Family", Vallentine Mitchell, London, 2006). He was active in the Orthodox politics as well as in the Religious Zionist Mizrahi movement. Rabbi Yoel Babad was elected in 1936 as the rabbi of the town and he held the position until the Holocaust (Pinkas Kehilot, 350). The elections of the last rabbi led to a conflict between the dayan and moreh tzedek Rabbi N. Tanensaft, who wanted to become the rabbi of Solotvin, and the head of the community Meir Haller. The official institutions were forced to get involved in the conflict (Pinkas Kehilot, 350). 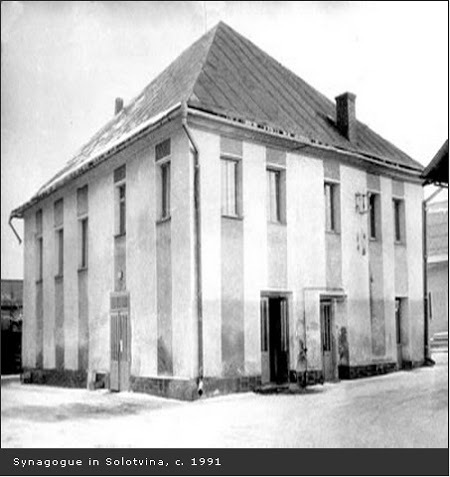 There was one main synagogue in Solotvin in the center of town - it still stands today. During WWII it was used as a warehouse and today is out of use. There was another small synagogue linked to a hassidic group from Nadvorna a few kilometers north of Solotvin. It was burned down in the war. Some families had a small synagogue in thier houses, such as the Juran family. A letter to Ignacy Mościcki the President of the Republic of Poland in 1936. Rabbi Ire Tenenzapf askes the help of the President to remain the Rabbi of Solotvin.